Corn and I are the best friends! I like corn so much that I can just eat a bowl of corn for lunch and nothing else! Here is a rice variety I usually prepare with corn. BTW, I clicked these pictures at night with the trick I told at Anudivya’s place. I just switched off the lights in the room, clicked it using the camera’s flash. Don’t you think they came out good? I used the same trick for the pictures of Banana Bread that I posted earlier. Heat the oil in a non-stick pan and add mustard seeds. When they splutter add cumin seeds and fry a little while. Then add the cashews and sauté till they turn brown in color. Later add corn + peas + cilantro + sambar masala + garam masala + chili powder + sugar + turmeric and fry for some time. Add a cup of water to cook the corn. Masalas can be adjusted according to individual spice levels. When all the water gets absorbed add cooked rice + lemon juice and mix well. Adjust salt. Keep the pan on the flame for some time and stir well. Then switch off the flame and leave the pan on the stove for 5 minutes. Finally transfer corn masala rice to a serving plate and enjoy with some curd on side. 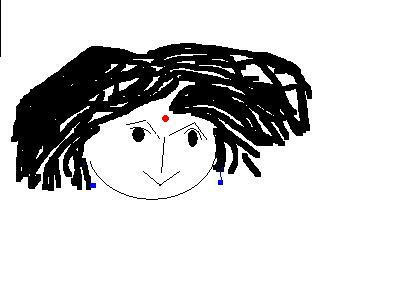 This is my contribution to Srivalli’s “Rice Mela”. Hema Balji has passed “Perfect Blend of Friendship, Yum Yum Blog, Hard working blogger, Great Buddy, Kreativ Blogger” awards. Vibaas has passed the “Yum Yum Blog” award. Dibs has passed “Hard working blogger, Great Buddy, Kreativ Blogger, Butterfly, Inspiration, Chocoholic, Perfect Blend of Friendship, 3600 Foodie, Good Job” awards. Indrani has passed “Hard working blogger, Great Buddy, Kreativ Blogger, Butterfly, Inspiration, Chocoholic, Perfect Blend of Friendship, 3600 Foodie, Good Job” awards. Thank you so much for your friendship dear friends! I appreciate your nice gestures! Hey,this is really a cool recipe and I will surely try this sometime when I buy corn...looks mouthwatering! I am gonna try this trick, mostly it is dark whilei finish baking or cooking as it is winter here. Love the rive, looks yumm. Mouthwatering recipe... That too very easy to put together. Congrats on those well deserved awards. Corn is my favourite too. Rice and corn looks yummy. Must try this soon. Nice trick with camera. Really yummy and lovely rice!! looks yum..corn rice is a great idea..will do it next time I buy corn..
sounds interesting and guess easy to fix. Kinda different rice dish...loved ur tricks for clicking..will try them too.. I need to try that too Uma. The masala rice looks really good. Nice click even in the dark. Looks like bisibelabhath with corn.Nice recipe. I was hunting for a nice recipe last weekend for my daughter.. and I wish I had this recipe before :) Looks lovely and tempting, Uma! I should try my night shots with only flash! The picture has a great lighting.... Thanks sharing this idea! i usually don't put flash for food photography.. ur pic has come out very good in dark. doesn't look as if u shot at night. 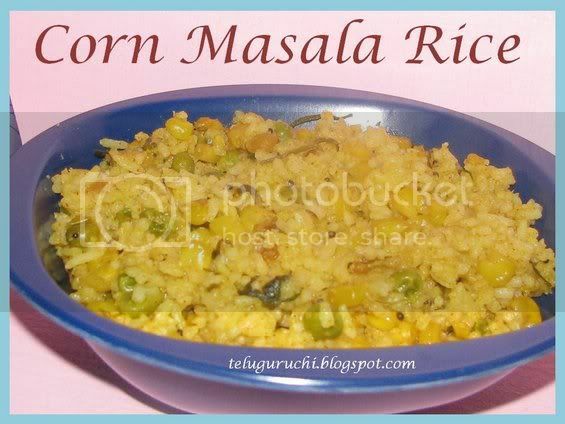 corn rice looks yummy.. never tried using sambar powder in rice items. That looks great Uma. Unfortunately my husband's not a big fan of corn so hardly use it in my cooking. Love the corn....i dnt know whether my husband will like it with rice....maybe i should try it once..
this look syumm Uma, its like bissibele bath with corn. 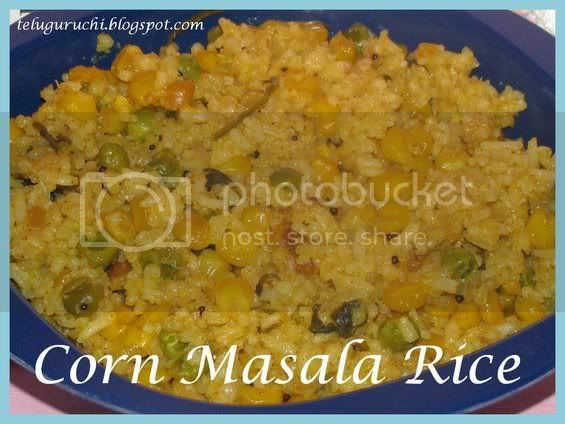 Thank you for dropping at my blog.Corn masala rice looks yummy...Pic r tempting..